Over 1000 Please contact us to discuss further discounts. Order before 12pm Monday-Friday for next day delivery*. Our offices are closed over the weekends & bank holidays. *Next day delivery is subject to having no courier issues. Some remote areas of the UK can take longer. 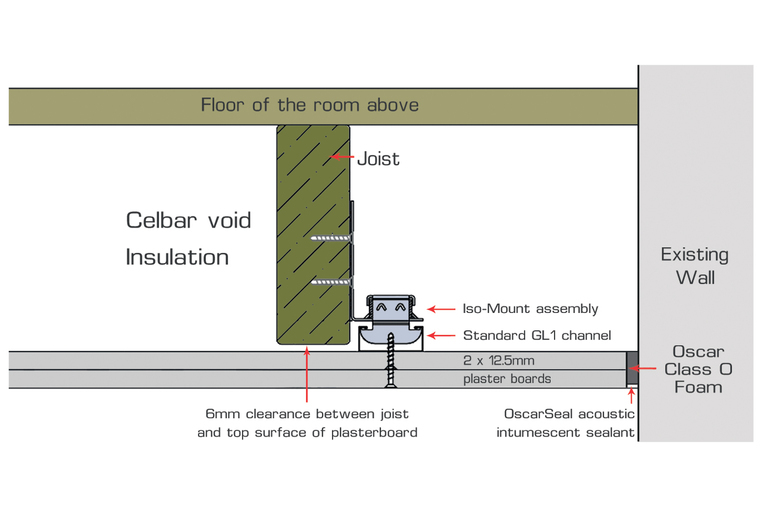 The Iso-Mount Type 1 achieves a 90 minute rating for fire resistance when using two layers of 15mm Fireline plasterboard. BRE fire test report available on request. How many Oscar Iso-Mounts do I need? Plus: The weight of down lighters, smoke sensors, grills etc that are to be fixed to the plasterboard. Consult the manufacturers of the plaster board for fixtures to be fixed directly to the plasterboard. Use fastenings as recommended by the plasterboard manufacturer. The maximum safe loading on each mount is 18kg (39.7lbs)*, under this maximum safe load there is up to 2mm (0.08 inches)*, deflection as the mount flexes and the rubber compresses. Arranging the Iso-mounts evenly spaced at 3 per square metre gives a maximum safe loading of 54 kg/sq mtr (11lb/sq.ft)*. See typical loading calculation above. 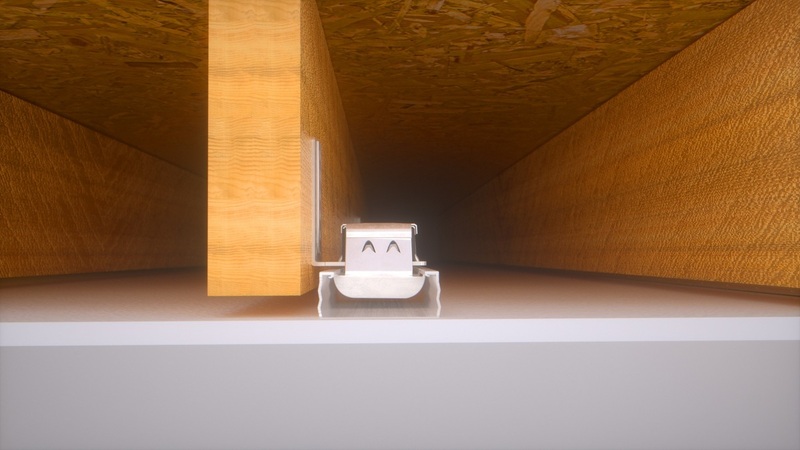 then Iso-Mount sound proof ceiling brackets are fixed along the joists at 100mm (4inches)* in from the wall at both ends then equi spaced along the joists at no more than 1m (3.28ft)*, intervals/centres. 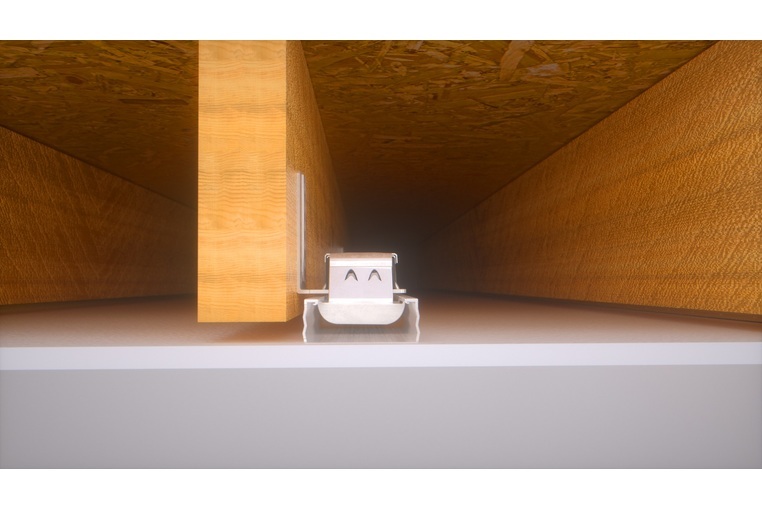 An isolating ceiling mount which significantly reduces transmission of noise from the floor above but only looses 6 mm of ceiling height and all work is done from the room below. 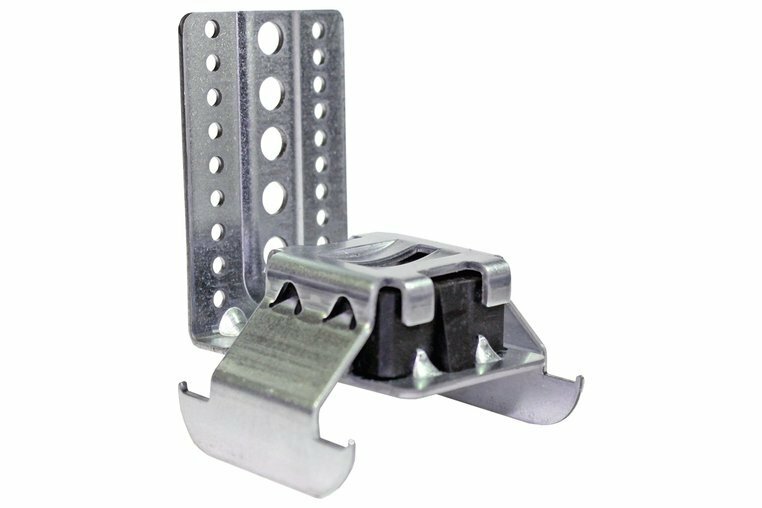 The Oscar Iso-Mount is a three component assembly; the metal 'L' bracket screws to the sides of the joists, a rubber block sits in position on the 'L' bracket and breaks the path of vibration to the 3rd component, a metal saddle that is held in position on the rubber block. House conversion to flats, new build and renovation of houses and flats. Shops, restaurants and other commercial sound proofing applications. Adjustable side of joist fixing. All work carried out from room below. Fast and simple clip together installation. Appears as standard plastered ceiling. Installation tests exceed Building Regulations (E&W) Approved Document E requirements. 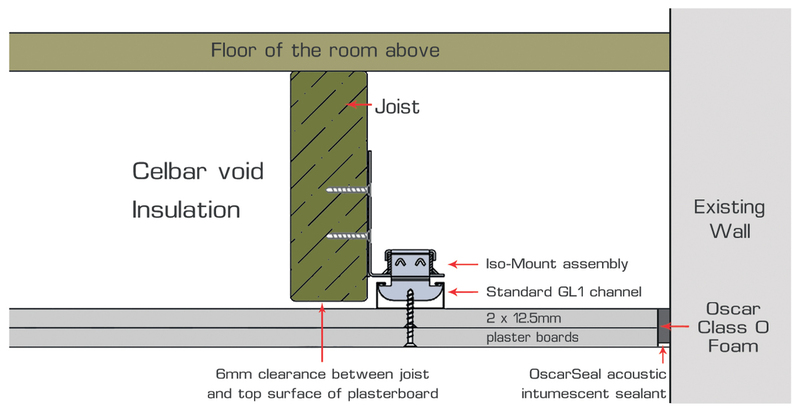 For more information regarding our Oscar Iso-Mount contact us direct on 01474 854 902 or request a brochure today.